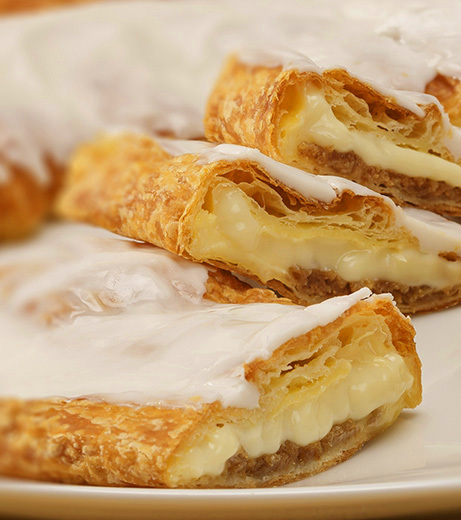 Silky smooth, classic, melt-in-your-mouth - the classic sweet vanilla flavor of Bavarian crème is one of a kind! 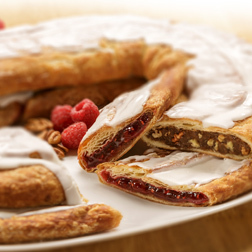 Our Bavarian Crème Kringle has a creamy and light filling with a hints of cinnamon and brown sugar, and sweetened with a vanilla icing. Who Are You Shipping To? Note: Enter first and last name of recipient. We will ask for shipping information during checkout. 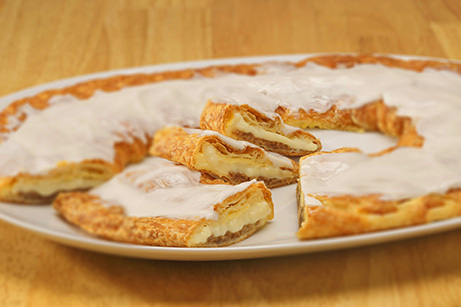 Contains egg, milk, soy, wheat. May contain traces of tree nuts (almonds, macadamia nuts, pecans, walnuts, coconut) and peanuts. Sugar, wheat flour, margarine (interesterified soybean oil, water, salt, mono- and diglycerides, colored with annatto/turmeric. Calcium disodium edta added as a preservative. Artificial butter flavor. Vitamin a palmitate added. ), corn syrup, brown sugar (sugar, cane syrups), eggs, corn syrup, corn starch, contains 2% or less of the following: water, soy protein, soy lecithin, yeast, dextrose, salt, citric acid, yellow 5 & 6, natural & artificial flavors, potassium sorbate preservative, sodium benzoate preservative, tocopherols preservative, calcium carbonate, xanthum gum, locust bean gum, soy flour, canola oil, partially hydrogenated soybean & cottonseed oils, maltodextrin, agar-agar, calcium propionate preservative, cinnamon, malted barley, color added.